We use technology to simplify our lives, keep us entertained, and sometimes just to distract us from certain hardships. But regardless of what you use technology for, eventually they’ll run out of power. 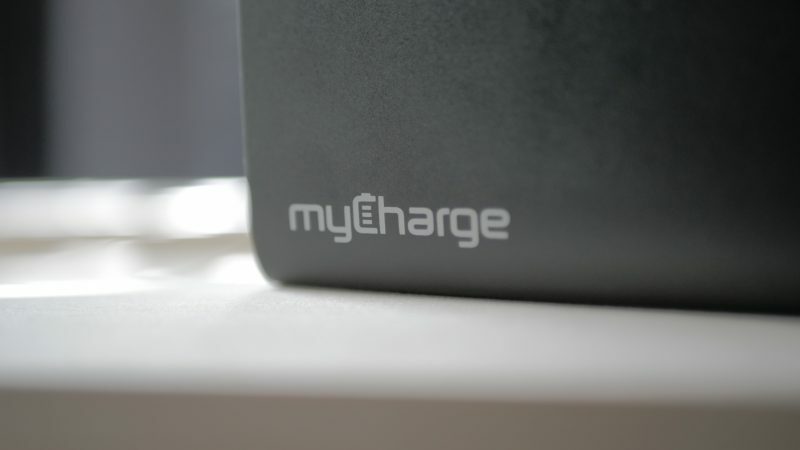 Mobile devices are what consumers use the most, and to keep them powered up and going, ‘myCharge’ has a portable charger that packs a whole lot of power. 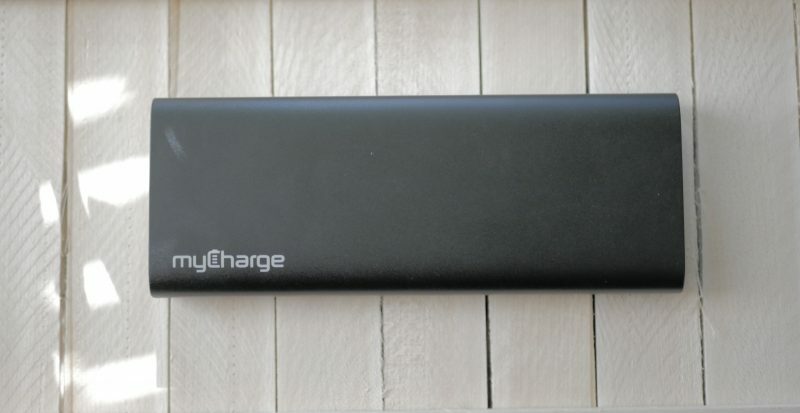 The RazorMega is one of myCharge’s biggest portable chargers, which is designed to charge multiple devices at one time. It has enough power to charge up any device that has a micro USB port, which includes smartphones, tablets, eReaders, and even Bluetooth speakers. The RazorMega has a nice rectangular shape to it with rounded edges that make it easy and comfortable to hold. The matte black paint has a textured feel to it so the charger doesn’t slip out of your hands easily. On one side you’ll find two USB ports to charge your devices, as well as a micro USB port that you use to charge up the razor mega. Right next to one of the USB ports you’ll find a button that will activate the LED lights that indicate how much power you have left on the portable charger. The RazorMega has a premium aluminum body and measures 2.6 in x 0.9 in x 6.8 in and weighs about 1.0 lbs. The RazorMega has a beefy 20,000 mAh Lithium polymer battery which does a great job of charging up numerous devices. On a full charge of the RazorMega, I was able to recharge my mobile phone twice, charge my PlayStation controller multiple times, and charge a set of Bluetooth earphones three times before I had to recharge the RazorMega. 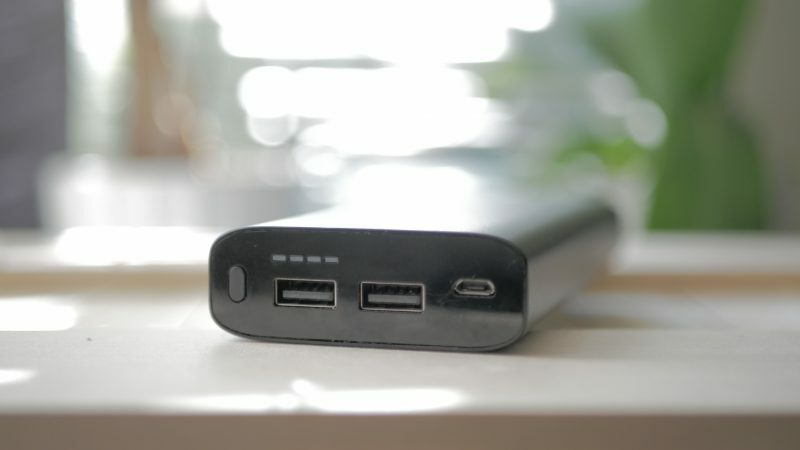 The USB ports have an output of 2.4 amps which helps it charge your mobile phone rapidly. At 20% battery life on my LG G6, I was able to recharge it to 100% in roughly 40-45 minutes. One downside that I found with RazorMega is that the 20,000 mAh battery takes a while to charge up. Having depleted the portable battery it took me almost a full day to recharge it back up to 100%. So if the RazorMega is drained of battery and you need to use it immediately on the go, plan to recharge this at least the night before. The RazorMega is a perfect companion if you heavily use your mobile devices. It’s a great size that makes it easy to store in your backpack or laptop bag. The premium aluminum body makes it sturdy enough to give you that comfortable feeling that it won’t fail on you while in use. The 20,000 mAh battery is impressive but does add some significant weight to the battery, which can be a downside to those who are looking for a lighter feel when carrying it around. The 2.4 amps can get you up and running with your mobile device in a matter of minutes. But once the RazorMega is out of juice itself, it does take a while to charge it back to 100%. Photo/Video Enthusiast and Escape Room "Semi-Professional"